Jose Canseco has admitted to taking testosterone in the Mexican League, has left his team, and will not play there this year. Canseco reportedly refused to take a drug test, and then admitted to league officials that he was taking the substance. We chronicled Canseco’s breakdown on Twitter two weeks ago, where the former A’s star started babbling on and on about putting on a show in batting practice, his exploits in the Golden Baseball League, and various cryptic quotes that were reminiscent of a 14 year-old Goth girl’s diary. All I have to say is, “well done Jose!” You have successfully perpetuated the stereotype that chronic steroid abusers never truly change, and that major league teams were wise to essentially blackball you from the game after your first book was released seven years ago. It’s a sad story, but honestly, can you really for sorry for the guy? He’s a loudmouth who thinks he’s some sort of pariah. I don’t really respect him for coming out with all of his accusations, mainly because they were given with no evidence whatsoever. This whole situation is a mess, and Canseco is a prime example of a former star who needs to disappear into the sunset as opposed to being an attention whore in the middle of our consciousness. 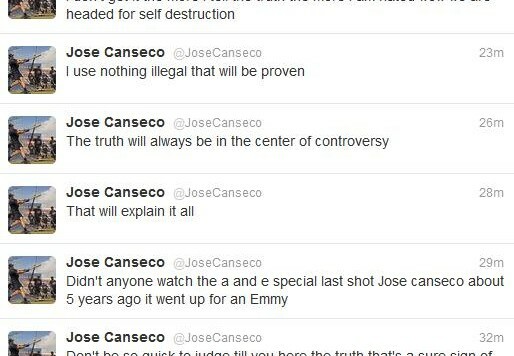 UPDATE: as Canseco is known to do, he’s jumped onto Twitter to defend himself. Good to see Jose is twisting the words in the article. Nowhere does it say that he tested positive. The article says that Canseco admitted to using a banned substance. Testerosterone is only banned if you don’t have a valid prescription. So technically, Canseco is telling the truth. He’s not using STEROIDS…but he’s using a substance that he doesn’t have authorization to use, which essentially makes it an equal violation.